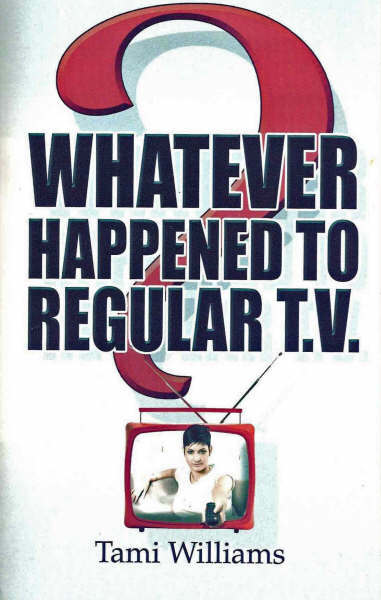 An interview I conducted with Tami Williams, author of Whatever Happened to Regular T.V. ?, which was published by PublishAmerica. Whatever Happened to Regular T.V.? Can you give us a basic summary of Whatever Happened to Regular T.V.? It’s about two women who go on a reality show. Instead of just playing the game and winning the prize, they find mysterious deaths and adventure. How long did it take you to write from start to finish? Because I wrote this as a short story to work on while working on my novel, it only took my about 3 months to write it. I was shocked when PublishAmerica agreed to publish it. I’m very happy too. Not too much for this story, I didn’t want to get too close to the real show. But for my other books, I do try to do some research. I don’t want to write something about a real person, place or thing and find out it’s wrong. Mostly because my new novel is about a member of the royal family, I’m trying to stay as authentic as possible. Many. I’ve read Agatha Christie since I was a teenager. I love her novels and then I’ve reached out. I’ve tried reading the classics to expand my mind. Some helped, others didn’t. I do love Jane Austen though. There are a number of Mystery writers that I love. Basically, if you’ve written a mystery there is a chance I’ve read it. I’m still finding new ones though. I love reading from authors who just started writing one day and went from there. It comes from their heart more than their mind. I feel it makes for a better story. No, only because I have 3 young girls. I try to write during quiet time, nap time, television time and bedtime. Since most of them change, my writing schedule changes. I do write every day though. It’s the only way I can improve, I think. Murder on the Orient Express, The Phantom, Ivanhoe, Elizabeth 1, I can keep going for a long time. That I feel that laughter is a good thing. I want people to find an enjoyment in reading my books. I love to write and tell a story. Even if it’s only to my girls, I’ll continue to write. I’m finishing my editing on a novel about the great-granddaughter of Anastasia Romanov. She discovers who she is and tries to make a life for herself. Along the way, she finds romance, friendship and some dead bodies. I’m also working on some short stories for Amazon. I have some short stories available to read for free at www.authorsden.com/tamimwilliams in case any one wants a sample. Listen to what Authors who have been in the business a long time recommend. They do it for free and they know what they are talking about. I’ve learned a lot from visiting different websites with tips for new authors. I swear everything I’ve read is right on target. Also, read books! Then write what comes out. Let the characters do the talking. For more information, please see Tami's website at www.whateverhappenedtoregulartv.info.